A lawsuit filed last week in San Diego [PDF] claims that the city did an inadequate CEQA analysis for a recent road diet and new bike lane on a stretch of Fifth Avenue. The city’s Bicycle Master Plan calls for a bike lane on that section of the street, and lists it as a priority project. A recently completed water main repair there, followed by repaving, gave the impetus to restripe it and, in the process, the city removed one lane of traffic and added a wide, buffered bike lane. Fifth Avenue is part of a north-south duo of one-way streets that connect downtown San Diego to Balboa Park through San Diego’s urban core. Together, they comprise one of the main corridors for bike access to downtown, with other parallel routes interrupted by steep canyons. They are also part of a planned “downtown loop” [PDF] which is being set up in anticipation of the bike share launch, now scheduled for next month. 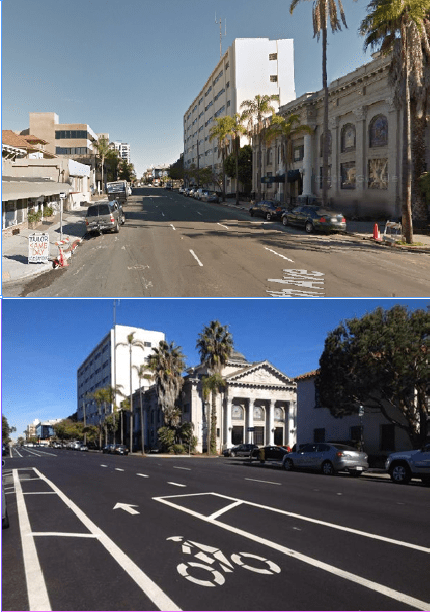 The section that is subject to the lawsuit is between Laurel and Upas streets, a nine-block segment that connects to Balboa Park, the zoo, and several museums, just north of the downtown bike loop. Although from the photos above there is clearly plenty of room on the street, at peak times it can get congested. For some people, that is an argument for a road diet, which can slow down and smooth traffic, allowing bicyclists to ride with at least some illusion of safety. But for others, the congestion is an argument to leave the bad design in place. The lawsuit was filed by Leo Wilson on behalf of the Bankers Hill Community Association–not to be confused with the Bankers Hill Community Group, which currently celebrates the new bike lanes on its website. The suit claims that the bike plan calls for narrowing traffic lanes to squeeze in a bike lane while preserving all three existing lanes, and that removing a lane should require a new CEQA analysis. The city won’t comment on pending litigation, but the lawsuit quotes San Diego Senior Traffic Engineer Brian Genovese as saying that the new striping is exempt from CEQA because the project is included in the adopted bicycle plan. It’s depressingly reminiscent of the 2006 lawsuit against San Francisco’s bike plan, which caused the city to delay putting in any bike facilities, including bike racks, for four years while it completed an expensive Environmental Impact Report that came to the same conclusions the city had reached without the report: that bike facilities do not create a significant environmental impact. This lawsuit makes claims similar to those in the San Francisco suit, saying that traffic congestion will worsen, and that vehicles will be diverted to other local streets. Unfortunately, the state’s Office of Planning and Research has not yet completed its guidance on S.B. 743, under which vehicle congestion will be removed from the list of environmental impacts that need analysis. Forget the forthcoming rules from OPR, it should be able to be tossed out based on AB 2245 alone. Though if OPR is going to be done soon and the judge plays along, this really could backfire and blow up quite big in their face. Since the new CEQA guidelines are VMT-based, I can’t wait to see the explanation for how more lanes (and thus more capacity) will lower VMT. Especially given the science backing the draw of good bike lanes. It is not clear that there will be any travel delay if bike lanes are at the expense of lane width rather than less travel lane. Traffic modeling would show no effective change other than diverted trips recruited to bicycling by new facility. What exactly does “smooth traffic” mean? So, even if the plaintiffs lose, they only pay their own costs and attorneys’ fees? Can San Diego recover costs if the agency prevails? If San Diego wins it can recover “costs”, such as filing fees and administrative record fees, but not attorney fees. When an Automobile is used as a Weapon of threats and terror, all respect is lost. You can keep your car behind a barrier. Good!… I can’t understand why they are taking away our traffic lanes for a couple hundred selfish bikers… why should bikes be allowed to tie up traffic?! I’ve driven down that street many, many times at all hours of the day – both before and after the restriping. The removal of the car lane has had zero impact on traffic. Traffic gets bad once you cross the 5 Freeway, but at that point, the bike lane disappears. I’m not sure the bike lane helps anyone all that much but to waste tax dollars to do an EIR and defend a lawsuit is completely stupid and pointless. Is this comment a joke? “Selfish bikers”… biking is a legitimate form of transportation that’s been around longer than the car and is healthier (for both the cyclist and the community it’s in)… How on Earth is that more selfish than someone driving??? Why should “selfish” drivers force bicyclists to ride in traffic adjacent to parking where car doors, when opened, can also cause problems. That said, I don’t consider most drivers “selfish” but do consider drivers such as yourself to be blind to the needs of others who may choose alternatives to cars. And most of those “selfish” bikers are also drivers at other times. But providing for bicyclists as with these lanes will reduce congestion in the auto lanes. I use these bike lanes and they are a great improvement in the neighborhood. I feel much safer so use my bike more frequently and my car less. Thus helping ease congestion and pollution. Wake up and get on your bike Maria. Additionally the streets are rarely congested to start with and 2 lanes are very adequate. San Diego residents should come to SF to see the worst possible outcome of street diets and badly designed bike lanes. Driver down third street at night in the pouring rain and try to figure out what is happening to the street lanes as they weave in and out of the bike and light rail lanes. Then do yourself a favor and LEAVE THE STREETS ALONE if you want the safest solution. SF has a board of directors on the MTA that comes directly from the Bike Coalition. Only bike friendly people are hired by the SFMTA so they will have no problem getting the city to approve their bidding. Only way to change that is to replace the Mayor or talk the Supervisors into taking responsibility for oversight of the SFMTA. It’s true that people should come to sf, to see that you are a moron. There are no bike lanes on third where there is also a light rail line. If you’re weaving, it’s because you have no business behind the wheel. Check this video we shot on Third Street and tell me that the lane in not merging onto the T-Line without warning and that the motion of the vehicle following the road is not forced to weave rather than drive in a straight line. We also have a cyclist running a red light taking a left onto the T-line where the traffic is flowing. In my book that is a dangerous move. San Francisco had about 418,500 residents who were commuters in the year 2000 and 51.3% of them drove to work according to the Census Bureau. In 2013 the number of residents who worked had increased by 12.9% to 472,400 and the percent of those who drove to work shrunk to 43.2%. The number of residents who drove to work decreased by about 10,000 in that time frame. Your advocating that residents who drive to work should move back towards the 51.3% that it was in 2000 by reducing the number of people who bicycle. Where would you put the additional 28,000 cars that are moving 5% of the day and are stored 95% of the time? How would this be an improvement in congestion to have this many additional cars moving during peak hours? How would parking be improved with much more cars competing for the fixed amount of parking spaces on the street? And who would the movement of cars be improved when much more drivers would be spending more time driving around looking for those elusive available parking spaces on the streets? So, is that your way of admitting that you’re wrong and there’s no bike lane on 3rd? Because you are and there’s not. The only thing I see in your video is motorists in cars. Hard to imagine how it’s related to this article. It’s safe to say that if a travel lane had been taken to create diagonal parking on 5th, no one would be complaining. Yet we know, that free/low-cost parking INCREASES traffic and congestion, increases VMT’s and hurts Level of Service. Would Leo Wilson sue over more parking? I suggest a new word – “Car-Surpremacist”. I use this street both for my vehicle and bicycle use. The bicycle lane has had zero negative impact on vehicular traffic. It does however put it at a safer distance from bicycles. For whatever reason when some people are in control of thousands of pounds of deadly force they seem to loose sight of the value of human life and safety. Selfishness is their unwillingness to share the road – as if California State Law doesn’t apply to them. Sadly I see it all the time, and is reflected in comments like Maria’s. Unless I’m mistaken, only one board member has close involvement with the Bike Coalition, but it makes sense to have at least one bicycle advocate on the Board of Directors given that San Francisco’s transportation policy prioritizes bikes over cars. If you cannot stay in your lane while driving in the rain, it is recklessly dangerous for you to be driving at all. This is a good point and with the four-year bike injunction, it’s only been in the last few years we’ve started getting safer, higher-quality bike lanes. Third Street is a good example of a transit project predating the Bike Plan and hesitant to remove parking, traffic lanes, and even stops. There are no bike lanes on Third Street, light-rail stations are often only 3-4 blocks apart, and the resistance to removing traffic lanes means a stretch where the transit lanes end and trains stopping in the middle lanes (like a car stopping for a left turn without a dedicated turn lane) at stations in the median. For only part of Third Street there is a bike lane on the neighboring street. Where the project done over with the Bike Plan in place it’s likely there would be dedicated bike lanes on Third or along an adjacent street. “It’s safe to say that if a travel lane had been taken to create diagnol parking on 5th, no one would be complaining” – and you speak for who? The merchants and commuters and residents of that area? I don’t think it is safe to say, so maybe you shouldn’t say it. Way to stay off topic. So when you say, “Our traffic lanes”, you are referring to all forms a mechanized transportation; right? Under the old design, a cyclist was allowed by law to operate in the middle of both the right and left lanes. After all, we all know the access to the public road is a right, but operating a motor vehicle is a privilege. This design is actually for selfish car drivers, not for selfish cyclists. Before the redesign a cyclist could position himself in either the right or left lane, and have access to the middle lane if traffic in either of those lanes were congested. Thanks to CVC 21208, cyclists are now forced to use the bike lane. I hope you are happy, you have now pushed us out of your way. I won’t go so far as to say that I simply hope the suit succeeds, but I will say that I find it quite objectionable that any entity would consider eliminating considering traffic congestion and related emissions as something that must be considered in such situations. If traffic is merely slowed slightly, emissions may not be effected so as to harm the environment, and might actually be reduced. On the other hand, if significant congestion results, they should be. The point is that all these Vision Zero/Complete Streets changes are driven by groups other than motorists who, many times, are in the minority in terms of the numbers harmed or helped. Further, motorists are always are seen as the bad guys. The result is that potentially effective solutions in terms of safety goals that may produce significant undesirable changes in drivability are often implemented. Officials fail to search for redesigns and reconfigurations that might well accomplish the same safety and bike-rideability goals with far less impact on motorists. All 3 modes of travel need to be represented. Complete streets are often complete for only 2 of the 3 modes when motorists are not represented in the politics or adequately considered in the discussion. what evidence is there that “road diet” (stupid term) slows down traffic? Drivers speed EVERYWHERE. Narrowing lanes, radar, etc doesn’t slow them down. We could install speed bumps on every single street in America. I oppose that. Eyes on the Street: Venice Boulevard Resurfaced, Bike Lanes Soon?